I know that it is only May, and if you are anything like me then you do not really bring out your table toppers until the holidays. I always start with Halloween. But I was thinking that it might be fun to make one that is a little less festive, and a little more for everyday use. I think that it is due time to add a Summer table topper to my house, so i started looking through some videos and ideas and I think I found one that is very much worth sharing with you. It is presented to us by Donna Jordan, from Jordan fabrics, and she calls it the topsy-turvy topper. I think that this name is just the cutest and so fitting for the project itself. It is also very simple, so any quilting beginners out there who may want to venture from actual quilts themselves should give it a try. Want to know something kind of cool behind this idea? Donna got the idea for it by looking at pictures she had taken of jelly rolls from her collection (Jordan Fabrics). I thought that was pretty cool. The table topper is exactly what it sounds like, strips that are slanted and Donna did it with some crazy patterns and colors. I liked the look of this, and plan to do it with lighter colors for Summer. You could also take it the simple route and do some solid colors, it is really up to you. 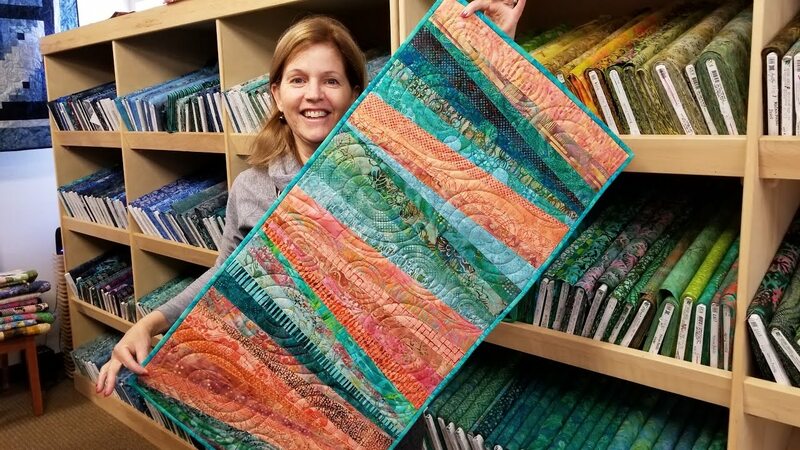 Donna used a simple strip set and her basic quilting tools (cutter, straight edge, etc.). To really get an accurate image of the table topper and all that it entails, you should watch the video tutorial that is linked below. I think that it is very helpful. Once again, if you are a beginner do not be afraid to try this one out, and I hope you all love your topsy-turvy table topper. Send Pictures of your table toppers! Suzanne Allen this pattern is for you happy sewing! this is wonderful, a great tutorial!!! I think I’ll do this one! How Us Folks Do Up Our Vans, hope this is ok.